President Mohamed Farmajo landed in Nairobi on Monday, November 25, to attend the Maritime Economy Conference. The biggest surprise was that the Kenyan official who received Farmajo at the airport was Nairobi ‘s County Governor Mr.Sonko, the lowest ranking Kenyan official ever to welcome a visiting Somali president. 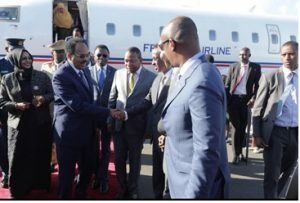 Gone are the days when Farmajo, then an opposition leader, railed against then-sitting Somali presidents for being received by ministers and regional leaders in foreign capitals. Today, Farmajo has broken records for being the only Somali president who is constantly received by foreign officials not equal to him in rank and status. 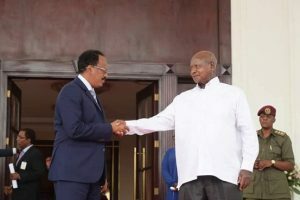 A few days ago, Farmajo was in Uganda where President Yoweri Museveni received him at the presidential palace. The cold chill Farmajo got there and the arm-length handshake by Museveni was different from the let-me-hug-you environment and warm collegiality Farmajo has been getting from Ethiopian Prime Minister Abiy Ahmed and Eritrean President Isias Afwerki. It is an unfortunate state of affairs: Somali president not receiving the respect and dignity he should be accorded. Note: WardheerNews made correction of the photo and the name of the current Governor of Nairobi County, who received President Farmajo at the airport.